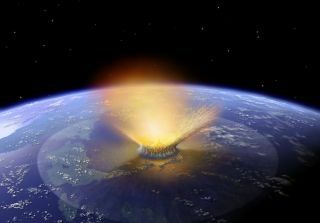 An artist's illustration of a massive asteroid impact on earth. Some single-celled organisms may be able to survive extreme impacts such as these, scientists say. Scientists have long debated the possibility of that the microbial seeds of life did not originate on Earth, but were perhaps delivered here from an alien source, encased in comets or meteorites from Mars. But to get here, simple life forms would have had to endure a litany of harsh cosmic conditions, including ejection into space, freezing temperatures, fiery re-entry and impact. The scientists, who presented their findings at the European Planetary Science Congress in London on Sept. 12, focused on a type of single-celled ocean-dwelling algae called Nannochloropsis oculata. Using a two-stage light gas gun, the researchers shot frozen pellets of the algae into water at extremely high speeds and then analyzed their sample to see if any of the organisms came out alive. "As you might expect, increasing the speed of impact does increase the proportion of algae that die, but even at 6.93 kilometers per second (4.31 miles per second), a small proportion survived," study researcher Dina Pasini, of the University of Kent explained in a statement. "This sort of impact velocity would be what you would expect if a meteorite hit a planet similar to the Earth." The researchers say their findings suggest that alien life and panspermia may not be impossible, though the theory still remains unproven. Pasini and colleagues noted that space travel might not be so bad for a tiny life-form. Enclosed in a natural spaceship of rock and ice, alien organisms might be protected from radiation and extreme heat. "Our research raises several questions," Pasini said in the statement. "If we find life on another planet, will it be truly alien or will it be related to us? And if so, did it spawn us or did we spawn it? We cannot answer these questions just now, but the questions are not as farfetched as one might assume." Pasini's research is not affiliated with another study announced Thursday (Sept. 19) that claims to have found evidence of alien life in Earth's upper atmosphere. That separate study is based on findings by British scientists who deployed a research balloon over England. The balloon returned a sample containing the cell wall of a diatom, a type of microscopic algae. The British researchers, led by astrobiology researcher Milton Wainwright, of the University of Sheffield in the United Kingdom, took the discovery as proof that life is continually arriving to Earth from space and perhaps didn't originate on our planet, but the claims have been met with wide skepticism.